Like many artists who decide to start their own labels, the inaugural release usually tends to be from the label-head himself. 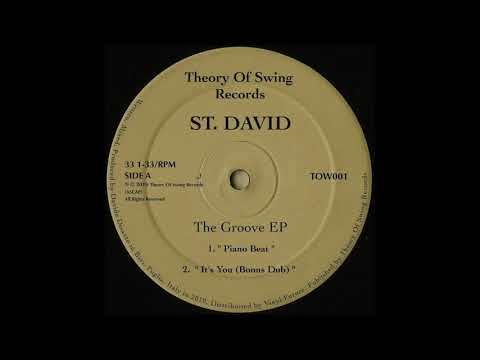 Titled The Groove, St. David has chosen to put together 5 hard-hitting, old-school tracks that will certainly fill all you 90’s-house heads with delight. To get a sense for what he has in store for you, we’ve decided to premiere his original “It’s You (Bonus Dub).” Featuring a sassy, seductive vocal throughout its entirety, St. David masterfully crafts an all-out groove by utilizing his signature MPC2000 skills that expertly arrange an assortment of funky basslines and head-bobbing percussion. For those looking for some no-frills, house fodder to get the club pumping with energy, look no further! To get a copy of The Groove, make sure to pre-order the record by following this link right here! The EP is set to hit shelves on April 30th.